Katie Overdirth-Stanton Sharp, 82 of Waxahachie, Texas passed away Monday, November 12, 2018 in Waxahachie. She was born on April 16, 1936 in Palmer, Texas to the late James Perry Proffitt and Nannie Irene Adams Proffitt. She attended Waxahachie High School, after high school she married Charles Henry (Charlie) Overdirth on July 31, 1954 in Ennis, Texas. She later married Vernon Stanton in August of 2000. 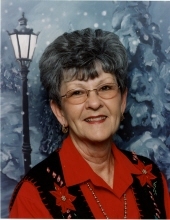 Katie was a hairdresser in Waxahachie for over thirty years, she loved dancing and playing the slots at the casino. Katie was also a longtime member of Farley Street Baptist Church. She will be dearly missed by her family and friends. She is survived by her three daughters, Donna and Randy Hughes, Mary and Reuben White of Waxahachie, Tx., and Nancy and Randy Merrill of Waco, Texas. Granddaughters, Courtney and David Huskins, Kristi and Dusty Autrey and Mariah Yeaman of Waxahachie, Jordan and Aaron Herrera of Venus, Texas, Kerby Doughty of Waco and Ellyse and Ryan Dutschmann of Katy, Texas. One grandson, Chet and Danielle Doughty of Waco. 15 Great Grandchildren; One sister Mrs. Virginia Cleveland of Waxahachie, Tx. And several nieces and nephews. She was preceded in death by her husband of 43 years, Charlie Overdirth, Husband of 15 months Vernon Stanton and beau of 15 years, J.R. Crady. Parents James Perry Proffitt and Nannie Irene Adams Proffitt, 3 brothers: Richard, James Perry, Jr. and Willie Doyle; 5 sisters: Ollie Faye Mathis, Ruby Lee Nelson, Eva Lou Overdirth, Doris Roe and Lillian Neal. Services to celebrate her life are scheduled for Thursday, November 15, 2018 at the Pat Boze Memorial Chapel of Wayne Boze Funeral Home with Brother Richard Smith officiating. Interment will follow at the Lakeview Cemetery in Waxahachie. Visitation with the family is scheduled from 1:00 PM to 2:00 PM on Thursday, November 15, 2018 prior to the service. Pallbearers will be James Overdirth, Tony Overdirth, Jimmy Proffitt, Mark Nelson, Chris Nelson, Lynn Nelson, Steve White and Kim Hewson. Honorary Pallbearer will be Bryan Cleveland.